We’d love your help. Let us know what’s wrong with this preview of They're Your Kids Too by Anne P. Mitchell. To ask other readers questions about They're Your Kids Too, please sign up. This is not an incredibly long book (the last half is a phenomenal list of resources for fathers), but it is a wonderful resource for fathers facing any difficulties in custody battles with their exes. A very easy read, Anne Mitchell's writing is straight and very to-the-point. Having years of experience as a Father's Rights attorney allows her to speak knowledgeably and directly about these issues. 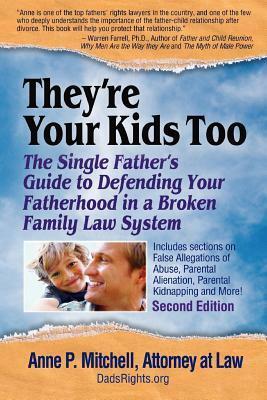 I personally am fortunate to be in a stable situation with my wife and children, but I immediately This is not an incredibly long book (the last half is a phenomenal list of resources for fathers), but it is a wonderful resource for fathers facing any difficulties in custody battles with their exes. A very easy read, Anne Mitchell's writing is straight and very to-the-point. Having years of experience as a Father's Rights attorney allows her to speak knowledgeably and directly about these issues.